In South Boston, the state police force is fighting Irish-American organized crime. Young undercover cop Billy Costigan (Leonardo DiCaprio) is assigned to infiltrate the mob syndicate run by gangland chief Frank Costello. While Billy quickly gains Costello’s confidence, Colin Sullivan (Matt Damon), a hardened young criminal who has infiltrated the police department as an informer for the syndicate, is rising to a position of power in the Special Investigation Unit. Both become deeply consumed by their double life, gathering information about the plans and counter-plans of the operations he has penetrated. But when it becomes clear to both the mob and the police that there’s a mole in their midst, Billy and Colin are suddenly in danger of being caught and exposed to the enemy. Each must race to uncover the identity of the other man in time to save himself. But is either willing to turn on the friends and comrades they’ve made during their long stints undercover? 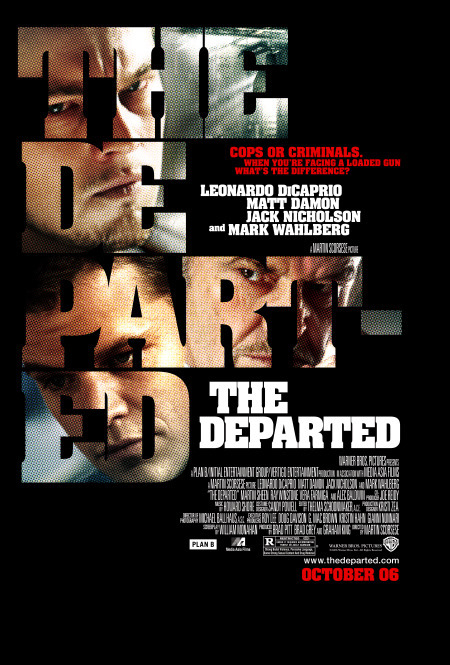 The Departed is a nice movie which keeps you watching as tension remains until the end. I give it an 7.5.